From the 6th to the 12th of September, 2017, the Institute of the Earth’s Crust SB RAS held the 2nd Russian–Chinese Meeting on Central-Asian Orogenic Belt and a related field trip. Among the Russian and Chinese participants of the Meeting were the geologists from Germany, Great Britain, Japan, Taiwan, and Mongolia. Alongside notable geologists, tectonists, petrologists and geochemists, such as Alfred Krener, Brian Windley, Tao Wan and Fengjao Xiao, there also were many – more than 60% – young scientists from Russia and China. During two days of the Meeting, the scientists presented thirty oral reports; there also were poster presentations on the main topics of the Meeting. The Meeting program also included the field trip: “The anatomy of the composite Olkhon terrane: Cross-section from the southern margin of the Siberian Craton into the northern CAOB”. Within four days, D. P. Gladkochub, T.V. Donskaya, V.S. Fedorovsky, E.V. Sklyarov and A.M. Mazukabzov arranged thematic excursions for the participants of the Meeting to see the most interesting geological objects in the Olkhon District of the Irkutsk Oblast. 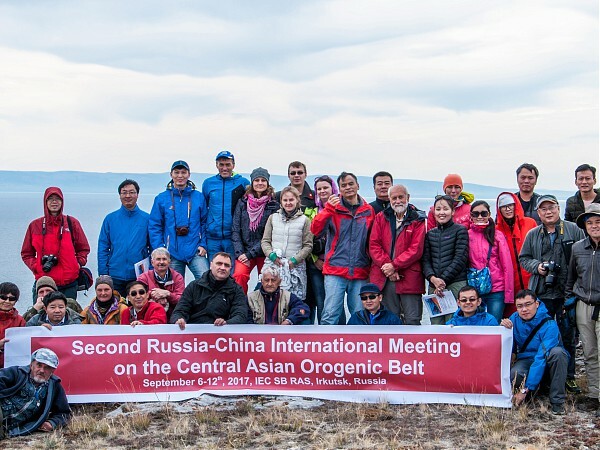 The 2nd Russian–Chinese Meeting on Central-Asian Orogenic Belt became the place for the international scientific cooperation of geologists and allowed the scientists from Russia, China and some other countries to come together to compare and discuss new results of the research on the initiation and development of the Central-Asian Orogenic Belt. The results of the Meeting will provide the basis for the preparation of the special issue of Geodynamics and Tectonophysics Journal, including the expanded abstracts from the Meeting. Download Taiping Zhao’s photos of the Meeting.